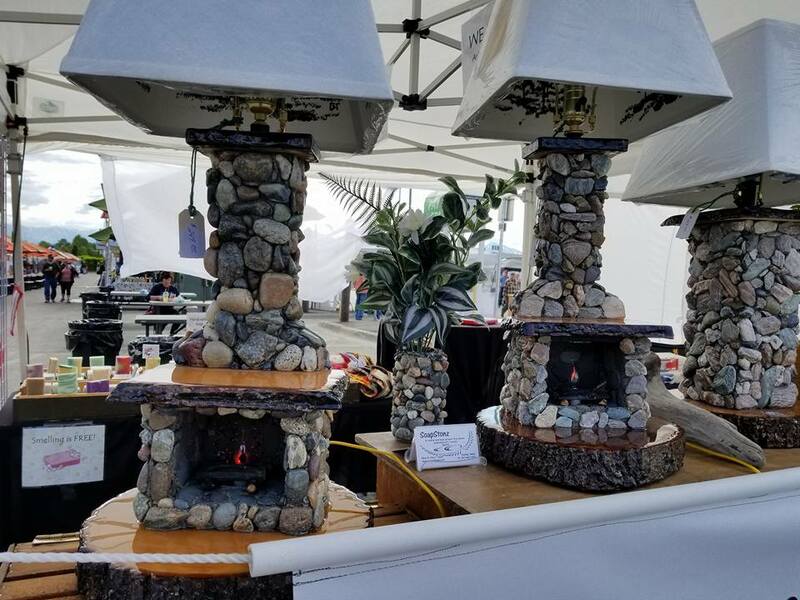 All of our unique stone products are available in either Kenai Beach stones or Denali/Interior stones or a combination of both. We add driftwood, pieces of shells and sea glass (as available) and per your request. Everything listed, except the lamps, will ship in a flat-rate USPS box, US only. If you have purchased from us in the past and do not see your product listed, give us a call and we will strive to fill your order promptly! 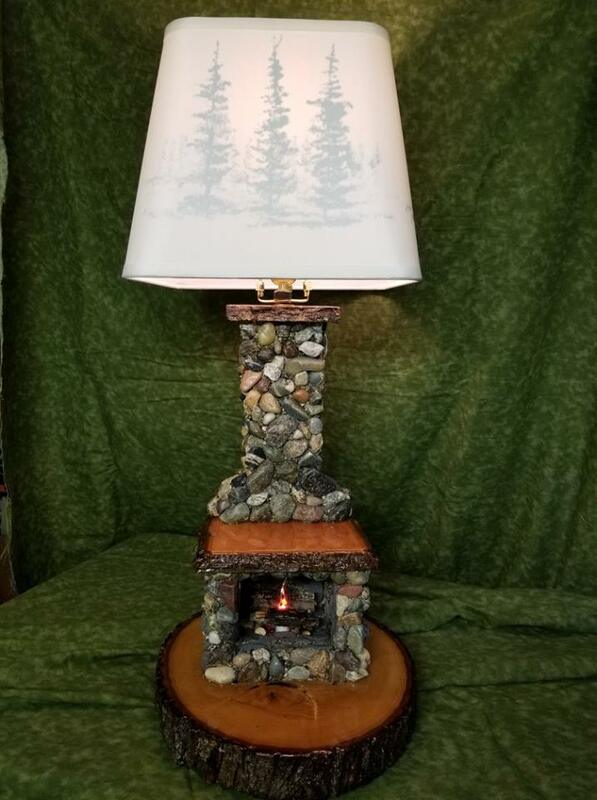 Our best-selling Fireplace Lamp is a favorite at the markets. With the flickering bulb in the fireplace, this lamp never fails to draw a smile from the crowds. The switch is 2-circuit which gives you the option of upper light on, fireplace flicker on, or both. 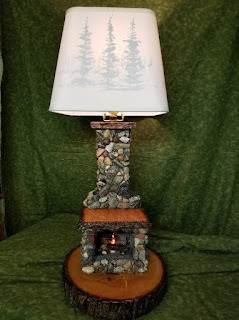 The shade features hand painted trees (by Dave) on the inside, which silhouette when the upper light is on. If you love the stones, but prefer something smaller, we offer the pillar lamps – round or square – with our lovely Alaskan rocks. A keepsake for generations to come! Same great hand painted lamp shade! Our stone vases come in 2 sizes. The 9” vases are great for dried flower arrangements or fresh flowers; our smaller “shortie” pot is useful for a candy dish, potted plant, candle holder, or collecting your loose change. Again, you have the choice of stones. These all fit in the medium flat rate box for easy shipping! These can usually ship 2 to a box. 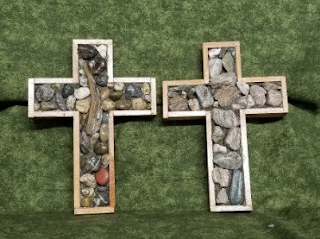 The crosses come in 2 sizes – and are completely made by hand. 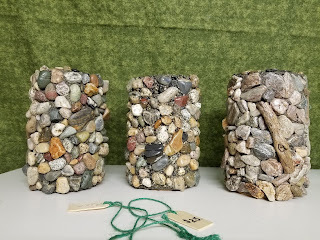 Again, choose the types of stones you prefer, and add driftwood and/or shells as you desire. 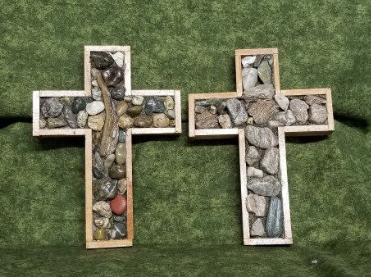 The small crosses will fit 2 to a box, if needed. This beautiful 8”x10” picture frame is completely made by hand. Choose the types of stones you prefer and add driftwood and/or shells as you desire.